When I was at school I wanted to be a journalist. Whether it was from watching Press Gang with Dexter Fletcher and Julia Sawalha or from voracious reading of Mizz and J17, I’m not sure. I don’t remember reading any children’s books particularly about journalism, but I liked the investigative side of Nancy Drew. and the diary technique of Z for Zachariah, Adrian Mole and so many others – and it seemed as if the writing buzz was the course to pursue. I worked on the school newspaper, then the university one (where Minerva Moan was born), and finally did a journalism postgrad before reality slapped me in the face and I fell into children’s publishing. 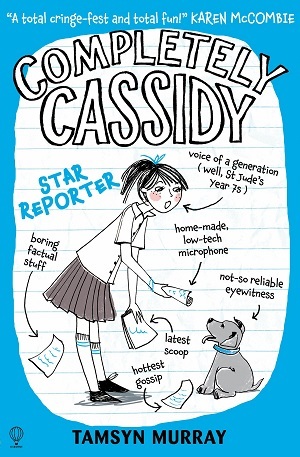 First up, Completely Cassidy: Star Reporter by Tamsyn Murray. The second in this series, the first of which I reviewed here. I don’t tend to review another in the same series within a nine month period, but Cassidy’s voice resonated with me the first time and I was intrigued to see if the second in the series retains the same spark. It does. Cassidy falls into journalism rather than pursuing it, and stays with it to impress other people rather than for her own love of reporting. She starts an online petition in favour of girls wearing trousers to school (mainly to cover up her own mishap with some fake tan), and the editor of the school magazine asks her to join. Of course, with Cassidy things never quite work out according to plan, and before long she’s desperate for a decent story. Jonny Jakes, on the other hand, rather like myself as a youngster, lives for the buzz of the story. Jonny Jakes Investigates: The Hamburgers of Doom by Malcolm Judge, came through the post and I read it without knowing any spoilers, so was hugely surprised with the turn of events. Of course, the title is a great play on words – hamburgers for harbingers, although I’m not sure how many children would understand the joke. Jonny Jakes runs the secretive school newspaper under a pseudonym so that he can craftily write sneaky stories about all the teachers and goings-on at his school without being rumbled. This would be story enough for me, but then, out of the blue, his headmaster quits and is replaced by an alien. Rather than get the scoop of the century though, Jonny is pipped to the post by his new headteacher, and Jonny is determined to investigate exactly what sort of head this alien will turn out to be. Written in diary form, the plot twists and turns and gets wilder and sillier, as befits the title. It turns out the headmaster is hypnotising all the students with his special sweets, and fattening them with hamburgers in order to eat them. Accompanied by gross descriptions of the aliens, and accounts of revolting smells, this book is not for the faint-hearted, but I’m sure will be embraced with much amusement by many children. The denouement is wild and fun and action-packed. There are inspired illustrations by Alan Brown, and it’s as far-fetched and imaginative as you would expect. Children – enjoy! 9+. To purchase, click here. The third reason for getting into journalism other than aforementioned peer approval and the buzz of the story, is money. Ivy and Bean: No News is Good News by Annie Barrows is a charming story in the long-running American series about two friends, Ivy and Bean, who, in this particular episode, decide to produce a community newspaper so that they can sell it to raise some money. The funniest element to me about the story is that they want the money to buy cheese. Not that they like the cheese, but they like that red waxy packaging in which the individually wrapped cheese comes…and their mother refuses to buy it for them. During the course of the small story we discover what a subscription to a newspaper is, how to earn money up front, and, just like Cassidy, when publishing a story can be morally ambiguous – especially if the story is embellished, embarrassing or just plain fabricated. Ivy and Bean is a series of books for newly independent readers, and although very American in phrase and tone, strikes a lovely chord here too, as it develops a cute friendship and showcases endearing childhood naivety. Sophie Blackall’s illustrations complement the stories well – it’s a good addition to any young reader’s bookcase. (An interesting fact – Annie Barrows co-wrote The Guernsey Literary and Potato Peel Society – see what a bit of investigating can throw up!). 6+ years. To buy a copy of the book click here.